Course Dates ​ LIMITED SEATING! The JHON-JHON® Institute is proud to offer a 2-day Hair Follicle Simulation training course. In partnership with NPM, an international leader in the field of permanent make-up and micropigmentation, we are able to offer a complete line of FDA approved machines, pigments and needles. Hair Follicle Simulation is an advanced Permanent Cosmetics course. If you are interested in taking a Micropigmentation Foundations Course, please click here. 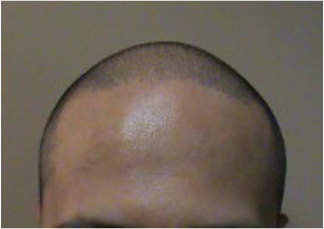 The popular scalp micropigmentation technique which we refer to as Hair Follicle Simulation, formerly Hair Follicle Replication, for men and woman uses an advanced hair follicle technique that replicates the 3D effects of natural hair follicle. Advanced techniques, specifically-designed needles, and specially-formulated hair color pigments are used to safely and naturally camouflage desired areas. Unlike others, our establishment uses an Advanced Hair Follicle technique that replicates the 3D effects of natural hair follicles since year 2007. 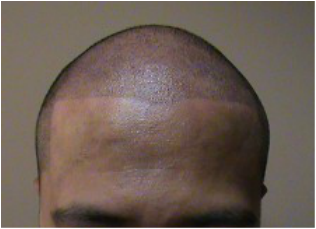 Shading, Fill-ins, Manicured hairline, and Natural hairline techniques can also be used to satisfy each clients' preferences on outcome. 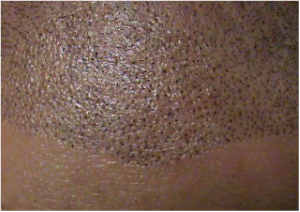 By definition, Hair Follicle Simulation is a permanent cosmetic procedure which masks the appearance of receding hairlines, thinning hair, hair loss, bald spots, scars, and burns using cosmetic tattoo ink to mimic the appearance of hair follicles. 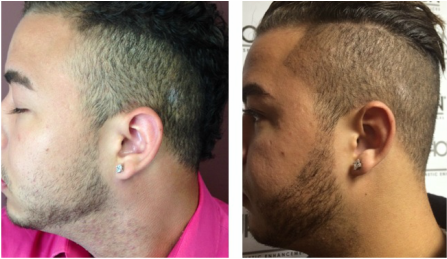 This procedure can also be performed to enhance or define facial and body hair. Our precision, technique, and extensive artistic background have provided a true satisfaction to many of our clients that have traveled throughout the world to our facility to experience this exciting procedure. We're here to answer any questions you might have! In-person instruction and hands-on practice is a must when it comes to an invasive procedure. Don't take shortcuts with "online" classes, only to be denied a business permit for failing to have proper licensing. Learn from the best with Jhon-Jhon! Jhon-Jhon is a National Board Certified Instructor. "I am a Certified and Licensed National Board Instructor for The Jhon-Jhon Institute. It is crucial for your Permanent Cosmetics/ Micropigmentation professional to be licensed, certified and practice legally. There are so many reasons why states are regulated for tattooing and/or undergoing the regulation process. Consumer safety, bloodborne pathogens, cross-contamination, insurance & liability, EXPERIENCE, etc. to name a few. This is why there are Board Certified and Licensed Micropigmentation/ Permanent Cosmetics instructors like me out there! It is our responsibility to help and educate the people in this industry. I am hoping that my upcoming TV series on Micropigmentation will enlighten consumers and members in this industry in taking the right precautions". Thank you for your patience as we update our website! We frequently post new content so please be sure to check back.